I’ve always thought of salmon as a fancy dish, but tin foil makes it so easy! Merideth and I made this during our beach retreat, and we both have made it at home since. My favorite part about this recipe is that it is more a cooking technique than a set formula: you can change the flavors to your taste (or what you have in the pantry!). 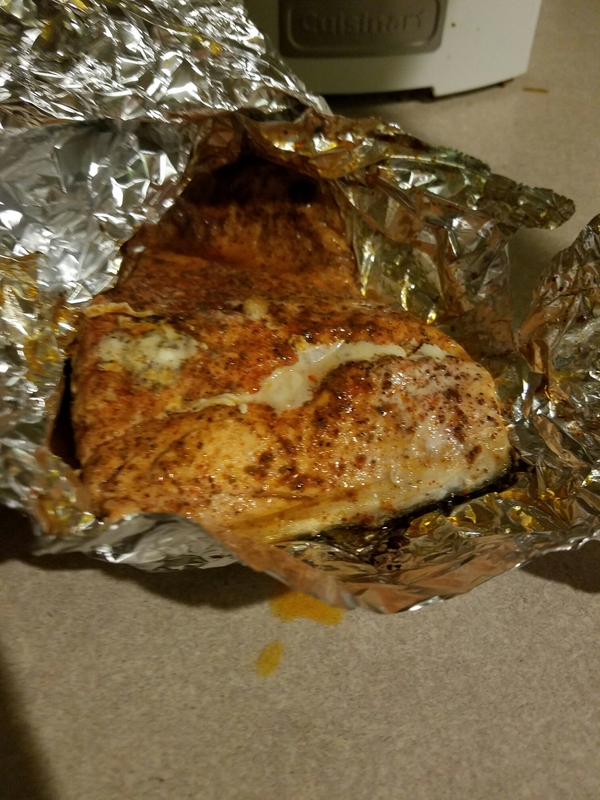 The wrapped foil packets are forgiving as well: as someone who is non-crafty and terrible at gift wrapping, my salmon looked like it had been crumpled in tin foil, but it still got the job done! At the beach, Merideth and I cooked this with lemon and leeks. We also tried cooking the filets on a bed of asparagus, but they didn’t quite hold their crispiness with the juices of the salmon. If you are going to steam vegetables in the packet with the salmon, I would suggest a heartier vegetable or potato. Lay salmon filets in enough foil to create a packet around the fish. Season salmon with salt, pepper, and garlic powder. If desired, add slices of lemon and leek. Note: we did not remove the skin, but you can if desired. Wrap foil packets, making sure all sides are covered, and place seam side up in the oven. You can place them on a cooking sheet or, as we did, directly on to the racks. Cook for approximately 30 minutes, or until salmon flakes and has taken on a more opaque color. I recently did this cooking method with a seasoning from my Raw Spice subscription (birthday present from Merideth- I love the recipes they include with each batch!) The smokey Bloody Mary seasoning was perfect on salmon. Set out three bowls and fill the first with flour, the second with the beaten eggs and the third with the panko and spices. Dip a few zucchini strips into the flour, then the eggs, and then the panko and set on a baking sheet. If you have a rack to elevate the fries above the pan, that would be ideal. Repeat this process with all remaining zucchini strips and arrange on baking sheet so as much air can move between them as possible. Bake for 10-15 minutes until panko begins to turn brown. Amanda and I recently had a girls getaway weekend at the beach, and did all the things we love together. Which is to say, there was a lot of show bingeing, pajamas, wine, and cooking involved that weekend. There was also an unfinished puzzle and some incriminating pictures taken of us in face masques, but that’s neither here nor there. I’m currently having the luxury of living within driving distance of Amanda temporarily, and one of the things I missed living so far away from her was my brunch buddy. Weekend morning breakfast indulgences with friends is one of my favorite things (makes me feel like a true millennial) so I knew I wanted to make us both a hearty breakfast to start our weekend of netflix….must stay energized for such a grueling day. Slice the sub rolls longways,3/4 of the way through if not pre-sliced. Heat the chorizo in a pan over medium heat and season with salt and pepper until starts to dissipate and chorizo is almost cooked through. Add the pepper and onions and cook the mixture until onions are slightly translucent and peppers are cooked. Spoon chorizo mixture onto the inside of each sandwich roll and spread on one side. Top with half of your cheese. Top the chorizo mixture with half the scrambled eggs on each sandwich and add more cheese to the top. You may need a napkin when eating this as it is a bit messy, but the heat from the chorizo is quite tasty! Wine pairing: We happened to have some sangria on hand (recipe to come), however a mimosa could certainly never go wrong.